Mid Year Examination Timetable 2019 is Out ! Attention to Sec 2s, 4s & 5s, Access your Mid-Year Exam Timetable HERE.. In Springfield, we nurture Students to be Lifelong Learners and Exemplary Leaders. As such, we invite Primary 6 Students with Sporting Talent to join our School through the DSA Exercise, Click Here to find out more..
Class Timetable for Term 2 2019 is OUT ! Access your Class Timetable HERE to set you ready for Term 2..
School Graduation Certificates are ready, please make your way to School to collect them, Thank you..
Dear Parent/Guardian, Springfield is embarking on a New Health and Wellness Program! Click on the link above for more Details. Access Term 1 Weighted Assessment Schedule HERE..
Dear Parents, The Parents Gateway (PG) Mobile App is an initiative by MOE to enable Parents to interact with Schools more conveniently on Administrative and Financial Matters. Click on the Title for more details. For more information please click on the title. Find out more on our Annual BBQ for Secondary 1 Parents! 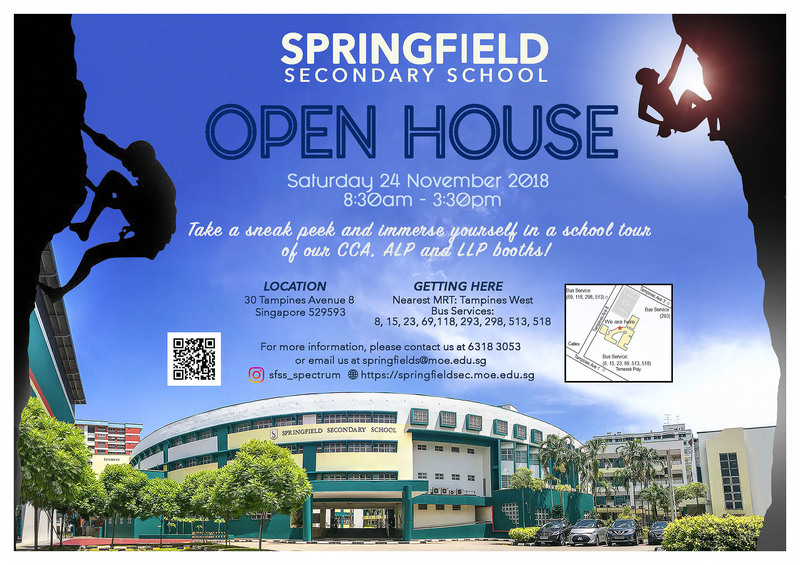 Find out more about our Open House 2018. Visit SFSS Kaleidoscope to find out more about the Event.